Canine myxomatous mitral valve disease (MMVD). A normal valve structure is shown in (a), and increased myxomatous pathology is seen a valve leaflet affected by MMVD (b). Sirius Red stain. 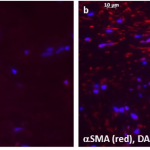 Low α-smooth muscle actin (αSMA) expression is see in normal canine mitral valves (a), while αSMA expression is increased in affected valves (b). αSMA: red; cell nucleus: blue. 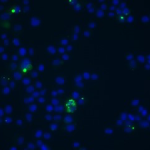 Extracellular vesicles stained with CFSE (green) is shown to be taken up by canine mitral valvular interstitial cells during co-culture. Cell nucleus: blue. 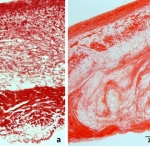 Doxorubicin therapy in dogs lead to cardiomyocyte loss with fatty change (a) and cardiomyocyte atrophy (b). 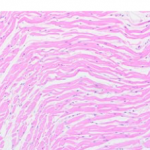 Normal left ventricular histology is shown for comparison (c). The Yang Laboratory at Cummings School of Veterinary Medicine at Tufts University investigates the role that epitranscriptomics plays in the development of veterinary cardiovascular diseases, such as canine myxomatous valvular disease, cardiomyopathies, and anti-cancer therapy-associated cardiovascular toxicities, and how manipulation of epitranscriptomics can be used to address these diseases therapeutically. Epitranscriptomics relates to the biochemical modification of RNA (transcriptomes) within the cells that will affect gene expression without changing the actual ribonucleotide sequences. Epitranscriptomic modification can occur via non-coding RNA (ncRNA) such as miRNA. miRNAs are short ncRNAs that can silence mRNAs and stop the translation of mRNAs into proteins. 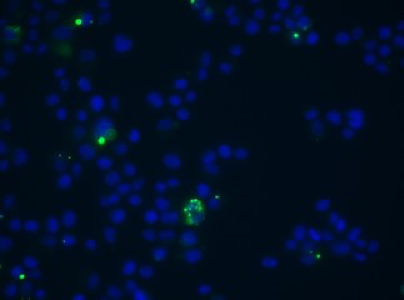 Our lab specifically focuses on miRNAs contained within extracellular vesicles, i.e., signaling packages produced by normal or diseased cells, which provide information related to the pathologic state of the cells. Our aims are to better understand the pathophysiology of veterinary cardiovascular diseases and disorders, discover therapeutic targets, and apply the knowledge gained from veterinary patients to human diseases. Patients of veterinarians and physicians both experience similar problems with respect to disease pathology, clinical symptoms, time-course, and patient management. Therefore, spontaneous disease models in veterinary patients (dogs, cats, horses, sheep, goats) are particularly useful to test the biological activity and therapeutic potential of extracellular vesicles. As part of Cummings School of Veterinary Medicine at Tufts University and as an affiliate of the veterinary hospitals, we are in a unique position to study spontaneous veterinary disease processes and relate these findings to human health. The Yang Laboratory also provides research support to the Department of Clinical Sciences faculty, trainees and their collaborators. For specific information on resources listed below, call (508) 887-4589. Building 21 is the Tufts Biotechnology Transfer Center on the Cummings School campus, which houses both academic and industry laboratories. The Yang Lab is a secure 900 ft2 lab space with access to autoclave, ice machine, and emergency generator circuitry. Accuri C6 flow cytometer, BD Biosciences; AutoMac Pro Separator magnetic cell separator, Miltenyi; QuantStudio 3 and QuantStudio 6 RT-qPCR, ThermoFisher; QX200 Droplet Digital PCR system, Bio-Rad; Agilent Bioanalyzer 2100; AxioImager Z1 upright microscope with fluorescence 100-630× mag optical, AxioVision software, Sigma Scan v.5; AxioVert phase contrast microscope 5-400× mag with RGB fluorescence filters; AxioObserver Z1 live cell inverted microscope with fluorescence (LED excitation) and DIC with automated X-Y stage and definite focus module, ZEN workstation, Hamamatsu high speed camera; Agilent 1100 series HPLC for size exclusion chromatography including FLD and second auto-sampler for high volume (900 ml) injections and metering; Nanosight NS300 with 488 or 630 nm laser excitation, Malvern; Optima L-90K Ultracentrifuge with SW-28, 44Ti, 55Ti, and 70.1 Ti rotors, Beckman Coulter; Biotek Synergy 2 Multimode plate reader (and luminometer). Cytospin4 Cytocentrifuge, Shandon/ThermoScientific; Cold Microfuge, Eppendorf; Deparaffin setup/glassware (e.g., Coplin jars); Microwaves; pH meter; Hemacytometers; Eppendorf Gradient MasterCycler; 2D gel electrophoresis system; Digital heater block; Vortexes; Sonicator; RNA/protein isolation supplies; Biosafety BSL2 and fume hoods; Trigas Incubator and standard CO2 Incubators, ThermoFisher; 37oC incubator; Dessicator (250oC, vacuum); BioRad immunoblot systems; RevCo/Thermo-Electron -80oC freezers; Upright refrigerators, upright freezer, under counter refrigerators; Liquid Nitrogen vapor-liquid cell storage unit, ThermoElecton Cryo 200, Cryoplus 2; Liquid nitrogen storage tanks (20 psi, 230 L capacity, leased); Accuspin 3R refrigerated programmable centrifuge, Fisher. We are proudly supported by the following organizations and institutions.